Work gets crazy, blog dies down; story of my life. I missed a post on the government shut down and the risk to food safety since the FDA was only checking meat and fish (not fruit, veggies, dairy products or anything else – remember the spinach and peanut butter salmonella recalls?!). You can instead read a good NY Times article about it if you’re interested. On to Halloween. I don’t have kids but have been contemplating what to hand out to the few children in our apartment building who will come knocking on our door (oh man I really hope they come!). 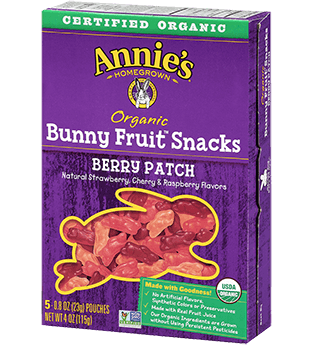 After much debate, I settled on Annie’s Organic Bunny Fruit Snacks. One selfish reason is because my husband loves them so we already have them in the house, and if the kids don’t show, he’ll eat them. The main reason though is that that they are a healthier (and still delicious!) option to candy. At 70 calories per pouch, while they do contain cane sugar, they also are made with real fruit juice, have 100% vitamin C, are gluten free and vegan (so no worries on allergies), and are non-GMO. Most importantly, they have no synthetic colors. I did a little research on a Halloween candy favorite, candy corn, and was disgusted to learn that there is more than a gram of sugar in EACH piece AND they are filled with Red No. 3. Red No. 3 is a synthetic dye, used to make them orange, which has been given a “high concern” rating by the Environmental Working Group because it’s a carcinogen. In 1990 the FDA instituted a partial ban on Red No. 3, citing research that high doses have been found to cause cancer in rats, but left it there much to the dismay of consumer protection groups. So while you won’t find it in lipsticks, baking mixes, seasonings or jello, you may still be ingesting it in soft candies, juices, gum, and breakfast cereals. Other candies on the terrifying list: Now & Laters with Red 40 carcinogenic dye, Necco wafers (Red 3 and 40, sweet double dose), and Sour Skittles (Red 40 and Yellow 6). Annie’s fruit snacks get their color from black carrots, which may lead to… improved eye sight? Check the labels and check yourself before you hand our fistfuls of cancer to the adorable kids dressed as princesses and pirates on your front steps this Halloween!